The Animal Health Foundation is pleased to announce the publication of a new study funded by donations to AHF's laminitis research fund. This study demonstrated that the digestive system contributes to high insulin levels and laminitis risk in some ponies. 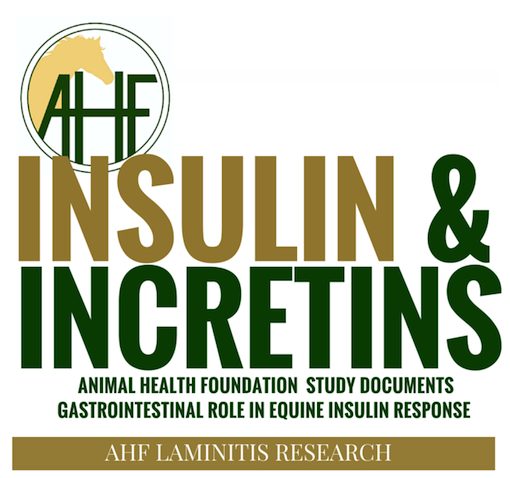 "Equine hyperinsulinemia: investigation of the enteroinsular axis during insulin dysregulation" was published earlier this month by the American Physiological Society, and is summarized here. Researcher Melody de Laat, PhD, BVSc and Professor Martin Sillence, PhD from Queensland University of Technology in Australia recently completed an Animal Health Foundation funded investigation of some of the gastrointestinal factors proposed to play an important role in causing hyperinsulinaemia (high blood insulin levels) in ponies. The aim of the study was to determine what contribution specialized gastrointestinal hormones, called incretins, make to the insulin response to carbohydrate-rich meals in ponies. During the study, they examined the insulin and incretin responses to sugar when it was given orally and intravenously in a group of ponies, as well as the ponies' responses to standard commercial grain meals. The glucose contained in feed is released and absorbed from the small intestine into the bloodstream after eating; it stimulates the pancreas to release insulin. Insulin ensures that glucose is taken up into cells where it is either used for energy production or stored for later use. During obesity or equine metabolic syndrome, this process becomes abnormal ("insulin dysregulation"), and more insulin than usual is released after eating. High insulin concentrations in horses/ponies can increase a horse or pony’s risk of laminitis. Incretin hormones are produced by special cells in the small intestine after a meal is eaten. These hormones, called GLP-1 and GIP, stimulate the pancreas so that it produces even more insulin than it would normally, in response to glucose. The additive effect of incretin hormones on insulin production has not been determined previously in ponies, but it was known that incretins can increase insulin production substantially in other species. Drs de Laat and Sillence confirmed that hyperinsulinaemic ponies (ponies with abnormally high insulin levels), after consuming a carbohydrate-rich meal, also had high concentrations of the active form of the incretin GLP-1. However, normal ponies secreted much less GLP-1. Another incretin hormone, GIP, was also increased by a high-carbohydrate meal in ponies, but it was not different between normal and hyperinsulinaemic ponies. These findings are important because drugs that can block the action of GLP-1 at its receptor can now be investigated as a treatment for reducing hyperinsulinaemia in horses. Dr de Laat and her team are currently busy in the laboratory working on this! However, despite confirming a significant role for the incretins, overall the study found that glucose was the most important stimulator of insulin production in ponies following a meal. The study also found that hyperinsulinaemic ponies absorb more glucose from their feed than normal ponies, and Drs de Laat and Sillence are continuing to investigate the differences in glucose absorption between normal and hyperinsulinaemic ponies. Given that the researchers found that the digestive system plays an important role in hyperinsulinaemia, they also wanted to investigate whether ponies that had insulin dysregulation always also suffered from tissue resistance to the actions of insulin (insulin resistance). They found that ponies could have abnormally high insulin responses to a high-carbohydrate diet repeatedly, but still be classified as normal on an intravenous test for insulin resistance. 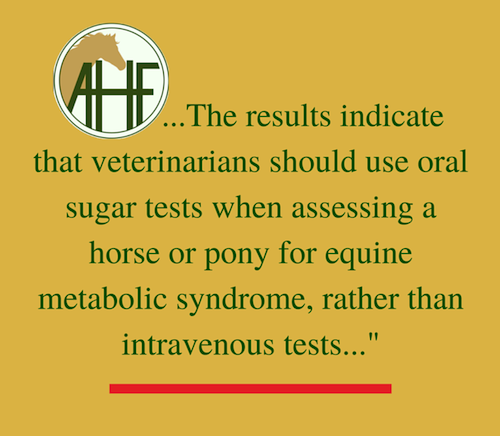 This important finding indicates that the problem of hyperinsulinaemia in horses likely originates in the gut rather than in other tissues, and that this is where future investigations should focus. 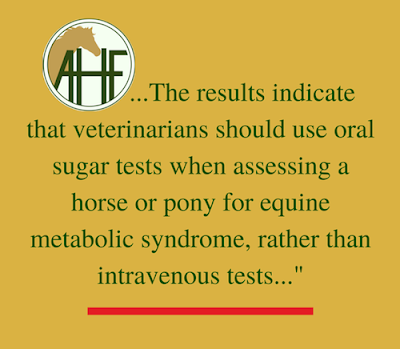 Furthermore, the results indicate that veterinarians should use oral sugar tests when assessing a horse or pony for equine metabolic syndrome, rather than intravenous tests, so that the test results include an assessment of the gastrointestinal system. 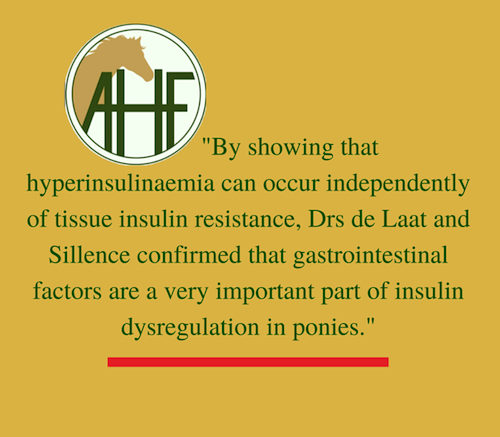 By showing that hyperinsulinaemia can occur independently of tissue insulin resistance, Drs de Laat and Sillence confirmed that gastrointestinal factors are a very important part of insulin dysregulation in ponies. Article © 2015 Animal Health Foundation. No use without permission. The Animal Health Foundation is interested in how the hormone insulin is regulated and utlized in the horse. We are funding extensive research in Australia in this area and welcome you to join us in supporting this project. Your large and small donations are welcome. You may use the "donate" button in the sidebar to make your donation, or click on the "donate" tab at the top of the page for more options. The AHF Memorial Wall is another way to make a donation, by remembering a horse whose name will be posted with yours on our growing memorial wall. Your donation will go directly to fund laminitis research. Thank you. Note: the study was published online by the American Physiological Society and will appear in a future edition of the Society's journal.